The Sleepy Eyed Goose Resort is the perfect place to plan your Curtis, MI Hunting Vacation. The Seney Wildlife Refuge is 15 minutes from our Curtis Hunting Rental Cabins and offers 90,000 acres for all types of activities: hunting, hiking, bird watching, cross county skiing & geocaching. State land is located near our Upper Peninsula Resort for rifle and bow hunting seasons. These amazing hunting opportunities give our sportsmen virtually unlimited hunting potential! Sportsmen can enjoy whitetail deer hunting, small game hunting, beer hunting, and bird hunting. The Sleepy Eyed goose resort has heated and baited blinds available for rental. 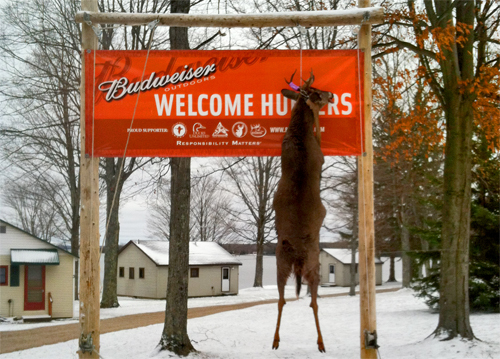 We make it easy for all of our sportsmen to experience our Upper Peninsula hunting season. Please let us know how we can help you succeed in your hunt for the big one. 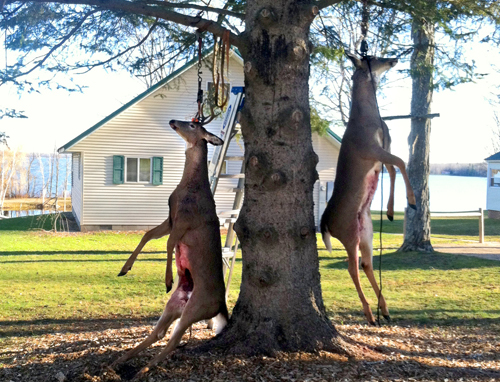 The Seney Wildlife Refuge Hunting has become an annual event for many of our area's guests and residents. The refuge allows for white-tailed deer in the following seasons: archery, regular firearms and muzzleloading. Other species available for hunts include: ruffed grouse, American woodcock, snowshoe hare, and black bear. Species not listed within their "Species Permitted and Dates Allowed" information may not be taken. People with hearing impairments can reach Seney through the Federal Information Relay System at 1-800-877-8339. We are your headquarters for outdoor recreation and when seeking a great UP adventure, we are "The perfect place to stay for all the action! ".